Sicily has a colorful yet mysterious reputation, a land of vast diversity and contradiction. In no category is this more perfectly represented than by wine, with the inky, robust wines of western Sicily contrasting with the oxidized white wines of Marsala, the fruity, ripe wines of Vittoria in the southeast, and finally the ethereal, unique wines originating from the live volcano that looms over Catania on the eastern shore. Graci, situated on the north slope of Mount Etna at Passopisciaro, is found in an area where viticulture dates back several thousand years. Their vineyards sit at an altitude between 600 and 1,000 meters above sea level. Planting density ranges from 6,000 to 10,000 vines per hectare. Many of the vines are still on original rootstock, ungrafted, having never been affected by the phylloxera scourge thanks to the unique nature of the volcanic soils. 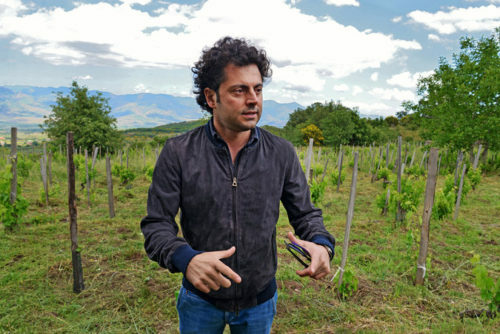 The vineyard is 1,000 meters high, or about 3,300 feet, the upward limit at which Nerello can ripen. Interspersed are olive and apple trees and birds, bees and bugs that fill the air with industrious chirps and hums.